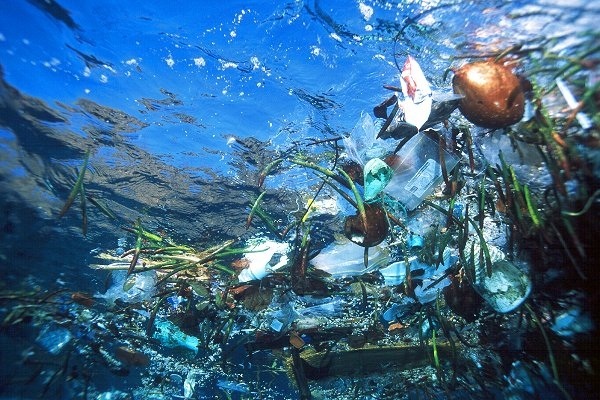 “Humanity’s plastic footprint is probably more dangerous than its carbon footprint,” said Captain Charles Moore, who, in 1997, discovered the Great Pacific Garbage Patch. Its name is misleading because the huge expanse of floating marine debris is actually more like a soup of confetti-sized plastic bits, produced by the runoff of our throwaway lifestyle that has made its way into our oceans. The Great Pacific Garbage Patch, the most notorious stretch of plastic debris, is located northeast of Hawaii, about 1000 miles from Hawaii and California. It’s an enormous and immeasurable area of marine debris, trapped by one of the five major subtropical gyres (systems of ocean currents) that corrals and carries marine garbage into its vortex. 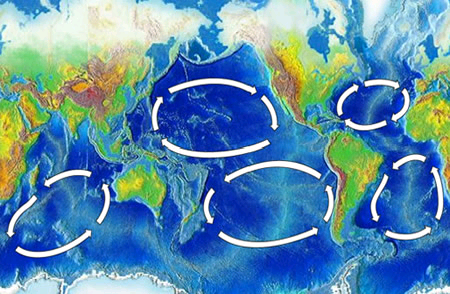 5 Gyres, an organization that partners with Moore’s Algalita Marine Research Foundation to study plastic pollution in the ocean, has sent expeditions across the North Pacific Gyre, the North and South Atlantic Gyres, and the Indian Ocean Gyre, and found plastic in every one of them, though concentrations vary. Some reports have estimated the Great Pacific Garbage Patch to be twice the size of the continental United States, but no one can accurately measure the boundaries of the trash gyres because they are vast, remote and always shifting with ocean conditions. In any case, plastic marine debris is now found on the surface of every ocean on Earth. Some plastic and marine debris comes from fishing gear, offshore oil and gas platforms, and ships. But 80 percent of it comes from the land—litter that gets stuck in storm drains and is washed into rivers and out to sea, the legal and illegal dumping of garbage and appliances, and plastic resin pellets inadvertently spilled and unloaded by plastic manufacturers. Trash Travels, Ocean Conservancy’s 2010 report, states that 60 percent of all marine debris in 2009 consisted of “disposable” items, with the most common being cigarettes, plastic bags, food containers, bottle caps and plastic bottles. And no matter where the litter originates, once it reaches the ocean, it becomes a planetary problem as garbage travels thousands of miles carried by the gyres. The lightness and durability that make plastic such a useful and versatile material for manufacturers also make it a long-term problem for the environment. Trash Travels estimates that plastic bags can take 20 years to decompose, plastic bottles up to 450 years, and fishing line, 600 years; but in fact, no one really knows how long plastics will remain in the ocean. With exposure to UV rays and the ocean environment, plastic breaks down into smaller and smaller fragments. The majority of the plastic found in the ocean are tiny pieces less than 1 cm. in size, with the mass of 1/10 of a paper clip. The Sea Education Association’s (SEA) expedition to the western North Atlantic Ocean found bits of HDPE (high density polyethylene), LDPE (low density polyethylene), and PP (polypropylene) from items such as milk containers, plastic bags, and straws, which float on the surface because they are less dense than seawater. It did not find PET (polyethylene terephthalate), PVC (polyvinyl chloride), and PS (polystyrene solid), which sink because they are denser than seawater. Algalita, which sampled down to depths of 100 hundred meters throughout the eastern side of the North Pacific Gyre, found LDPE, styrene, PP and PET. Last year, SEA released the results of its 22-year study of plastic pollution in the western North Atlantic and Caribbean Sea. The greatest amount of plastic was found in the North Atlantic Gyre, which contains the Sargasso Sea. The most plastic collected during a 30-minute tow was 1069 pieces, which, if scaled up, would be equal to about 580,000 pieces per square kilometer. The average concentration of samples would roughly equal 20,300 pieces per square kilometer. While discarded plastic in the U.S. quadrupled between 1980 and 2008, however, the concentration of debris in the Atlantic did not appear to increase. Where has it all gone? Lead scientist Kara Lavender Law speculated that some is being eaten by marine animals, some has broken down into bits too small to be captured by tow nets, some gets washed up onto beaches, and some is sinking to the ocean floor. According to Project Kaisei, a non-profit also studying marine debris, 70 percent of the man-made waste that enters the ocean sinks to the bottom. 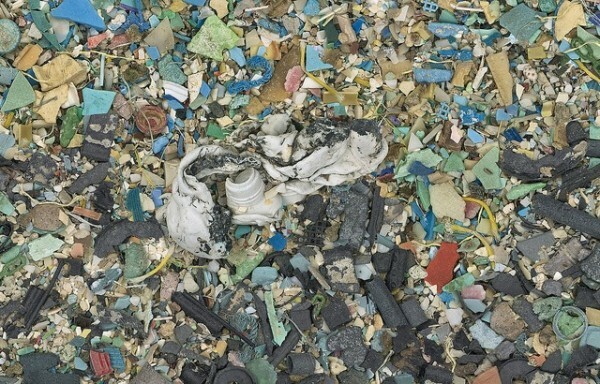 That means that the plastic soup is only the 30 percent of the debris that floats. No one knows what lies deep down because so far, there have been no studies of the plastic on the ocean floor. But we know the plastic debris on the surface of the ocean is taking its toll on marine life. Animals get strangled in fishing lines, nets, and plastic litter. Fish and seabirds ingest bits of plastic they mistake for food that can block their intestinal tracts and kill them, or make them feel full so that they do not eat real food.One of Moore’s expeditions collected hundreds of samples of fish, and conducted necropsies on them: over 1/3 had ingested polluted plastic fragments, including one 2.5 inch fish that had 84 pieces of plastic in its tiny gut. In 1999, Moore’s research in the Central Pacific found six times more plastic than zooplankton in the water. In 2002, off the coast of Southern California, he discovered the ratio of plastic to plankton was 2.5. Preliminary results on samples Algalita took in 2008 already show that there is a significant increase in the ratio of plastic to plankton in the water. 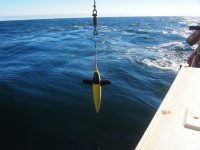 Plastic bits also create habitats for microorganisms and other species, allowing would-be invasive species to hitch rides to new areas of the ocean. Despite all these environmental and potential human health impacts, most scientists agree that it is not feasible to clean up the plastic soup in our oceans. The areas are huge, and the debris is unevenly distributed and always shifting. A cleanup would entail filtering enormous amounts of water, and the by-catch of plankton and other marine organisms would be harmful to ocean ecosystems. 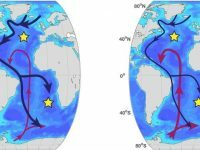 Moreover, the fact that the trash gyres are in the open ocean, in international waters, makes it difficult to get governments to invest in research or cleanup efforts. Undaunted, Project Kaisei, on its two expeditions to the North Pacific Gyre, has been working to develop and test new methods for removal of some of the plastic waste. Its goal is to learn more about how to efficiently remove the floating plastic, and to use new techniques to recycle the material into fuel or other products. Project Kaisei plans to test new, and scaled-up catch methods on future expeditions, as well as passive netting and catch methods that require little fuel and have low impacts on marine life. Moore and Algalita believe that the best way to deal with the plastic debris is to stop the waste from entering the ocean in the first place: to replace, reduce, reuse and recycle our plastics. Marcus Eriksen, one of the founders of 5 Gyres, also promotes beach cleanup because “What we now know is that if we stop adding more plastic to the ocean, in time the gyres will kick out the plastic pollution they currently hold. 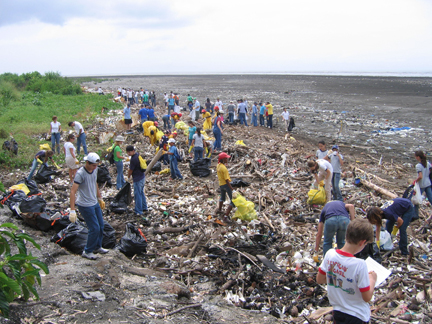 If you want to clean the gyre, clean your beach.” In 2010, approximately 500,000 volunteers did just that, taking part in the 25th Annual International Coastal Cleanup and removing millions of pounds of marine debris from 6,000 sites around the world, including all 50 U.S. states. The Algalita Marine Research Foundation has launched a three-year scientific study expedition to the Antarctic Ocean, and is planning a voyage to the North Pacific gyre in July. This spring, 5 Gyres is preparing to sail across the South Pacific Gyre from Chile to Easter Island. Findings from these expeditions and others will be shared at the 5th International Marine Debris Conference in March, 2011. I don’t think it takes a higher than average intelligence to see where this is headed. When you think about this, and combine it with over fishing and crazy low-pressure gas eruptions, it’s not too hard to see this leading to a sudden and terrifying decline in land animals. Large land mammals, especially carnivores, are starting to dwindle in Africa already. I may be just very pessimistic, but when you start to link it all together, it is terrifying. What a terrible thought that we only “see” an already giant 30% and that 70% is lying on the bottom of the ocean. I did not know this.. I believe the fish are going to take revenge. I Belive Bob is correct. Ewwwww this is disgusting, and I have to study it for school. Some people are just not smart enough to RECYCLE their stupid plasticiness. I think that we should do a lot more than this. This does not define humanity. Humanity is defined by helping ourselves and others. I agree with Jub Yah, this is serious pronlem, and if we don’t take action, this is gonna cause some really serious and irreversable damage. Its not just up to one person to recycle and its not just plastic bags causing the problem, especially seeing as their are lots of other materials pollutiong our oceans, like cigarette butts. If we want to keep being able to swim in the ocean and use this vital and crucial human resource, we need to do something nad we need to do something NOW, not tommorow, or next week, but NOW. Cleanup the world, do it yourself! Wherever, I go on a holiday, I clean up. My husband and I have bags in our rucksacks for that purpuse. Our hobby is bird watching and nature photography. As soon as we enter any nature reserve anywhere, we pick up the trash. After a while, people follow our example, and we have fun together. We did so in Trinidad and Tobago, and in Spitsbergen, for example. 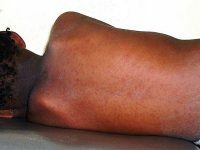 Attention: have your Hepatitis B vaccination!! too much trash not enough help. what is wrong with people? bob you must KNOW THAT HOW CAN FISH TAKE REVENGE THEY CANT GROW LEGS! When you think about it, amphibians are basically fish with legs. And also mexican walking fish! I feel bad for our planet too and the fish and animals that we are killing by our selfishness. I hope more people take notice of the problem and clean up after themselves and stop using plastic items that are just discarded after one use.